When you auction test equipment assets off, you tarnish your company’s brand and settle for less. Read on for the details. Auction is not a lucrative sale strategy, and when utilized can only capture a limited audience for your assets. Most large companies cannot afford to risk purchasing “AS IS” test equipment without warranties and without recourse for non-performance. Most companies only can purchase from their “AVL” or Approved Vendor List. Auctioneers do not typically offer terms or meet the criteria to be added to an AVL. So an auction audience is limited. When you sell your test equipment through auction, there is typically a Sellers premium of 8-10%, cutting into your return. When you sell your assets through auction, there is typically a Buyers premium of 10-16%, adding to the buyer’s cost, thus limiting their offers. 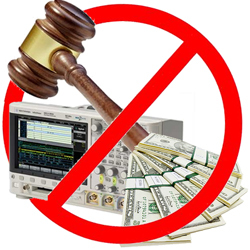 When you sell test equipment at auction you may have to underwrite each buyer if they do not have the cash to pay 100% in advance. Depending on the cost of your assets, this credit risk can wipe out your recovery completely if not managed correctly. There may be proprietary software or data on your devices that can fall into a competitor’s hands. Even asset tracking and calibration stickers contain data you should be protective of. Some auction bidders do not follow through with the purchase, leaving you still holding the asset. These false expectations can be time consuming, forcing you to engage the auction again. Test equipment auctions usually result in below market pricing, further reducing your recovery. Nobody pays full price at an auction and most all bidders are bargain hunters resulting in low bids. A no reserve auction can be risky if the bidding audience is weak. You could be “giving away” items at prices significantly lower than book value or lower than wholesale value. You can recover more with less risk by using our Real Time On-Site Virtual Consignment Services. We target, remarket and redistribute your test equipment assets directly to end users who pay the highest values for test equipment. On-site at your location, the gear is tested, cleaned, sorted, sold, packed, and shipped by our team of test equipment professionals. If your assets qualify, we will pay prior to shipping a minimum % of the total shipment, with a guaranteed price before the equipment leaves your location. No surprises with unsold, no bids, or no reserve items needing to be packed as a result of an auction agreement at absolute prices resulting in low recovery and no flexibility. Before your engage any auction house, contact Test Equipment Connection for a free consultation. Do not give your assets away, contact us today.